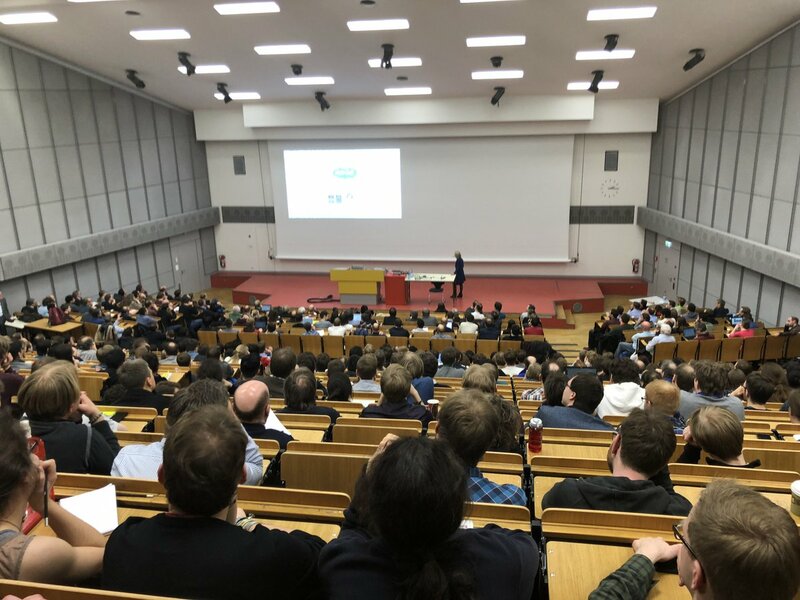 NOMAD's Claudia Draxl recently gave a plenary talk at the 2018 Joint Conference of the Condensed Matter Divisions of the European Physical Society (EPS) and the German Physical Society (DPG), the largest ever European physics meeting with over 6,240 participants. Speaking to over 700 attendees, Claudia shared exciting developments in mining raw materials science data to discover novel materials. With NOMAD innovations, precious materials science data will lead to truly advanced materials in the real-world. Claudia described the Open Science movement in materials science led by NOMAD and supported by the global community. Thanks to these efforts, a massively valuable collection of Big Data can now be easily found and accessed for free by anyone through NOMAD. Over 50 million open access total-energy calculations are available in the NOMAD Repository and Archive, and the number continues to grow every day. But NOMAD does much more than store and share data! Claudia gave a tour of the cutting-edge NOMAD tools that companies and researchers can use to develop better and completely new materials, which are freely available. She gave a demo of the Encyclopedia, a hugely powerful web tool that anyone can use to find materials in the NOMAD databases. Engineers can look for materials that will withstand hot temperatures or students can find out what materials are transparent. Dipping into the Big-Data Analytics Toolkit, which holds 16 powerful tools using the latest machine learning and artificial intelligence approaches, she spoke about how NOMAD tools can be used to find completely new patterns and information in materials science Big Data. Such patterns and information cannot be found with the human eye alone. Angel Rubio gave a plenary talk on “How photons change the properties of matter: QED-TDDFT an ab initio framework for modeling Light-Matter interaction”. Stefano Curtarolo gave an invited talk on “Novel high-entropy carbides discovered by synthesizability descriptors” at the “Topical Session on Big Data in Materials Science - Managing and exploiting the raw material of the 21st century”. Luca Ghiringhelli gave an invited talk on “Novel materials discovery: big-data-analytics methods and infrastructure for building maps of materials” at the Symposium on “Information Driven Materials Research”. Alessandro De Vita gave an invited talk on “Accurate and fast machine learning n-body force fields”.